We wanted to wish a warm and generous holiday season to all of our friends and family. We feel blessed to have shared another year with you. Thank you for the community that we grow into together. 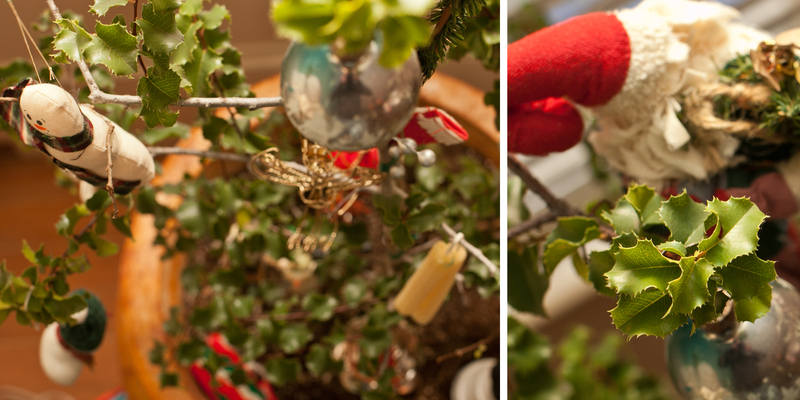 This year we decided to throw a curveball into the age-old traditional of the Christmas tree. We decided to purchase a live tree, and at that, we decided on a beautiful locally-native holly-leaved cherry (Prunus ilicifolia). This is a native rose that my botanist buddy Chris Thayer believes is fading from our area: the vanishing rose phenomenon. These comely shrubs are getting pushed out by normal (and maybe abnormal) climate change. As they cede to other vegetation, so do their wonderful March blossoms and yummy Cabernet colored fall berries. Here’s our native tribute to Christmas. Go Native Santa!